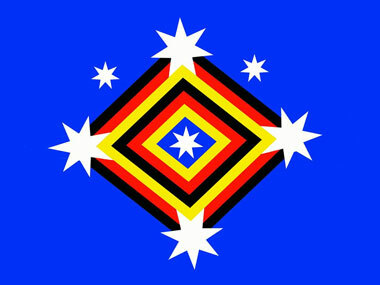 Kinship Seasons by Jandamarra Cadd. The Tandanya National Aboriginal Cultural Institute (NACI) is presenting three separate exhibitions at their Adelaide Galleries, opening this week, which will display works by two contemporary Aboriginal artists, Archie Moore and Jandamarra Cadd, to run alongside a show by Pitjantjatjara artists Tjamu Murray George, Inawynitji Williamson, Tjinkuma Wells, Purki Edwards and Kanginy George, whose works feature traditional representations of tjukula (rockholes), tali (sandhills) and kungkarangkalpa (Seven Sisters). Contemporary artist, Archie Moore, recently shortlisted for the 2015 Western Australian Indigenous Art Award (born Toowoomba Queensland), uses a variety of media including installation, painting, sculpture, photography and video. He will be giving a talk on Saturday 7 February 2014 from 11.00am to 12noon. 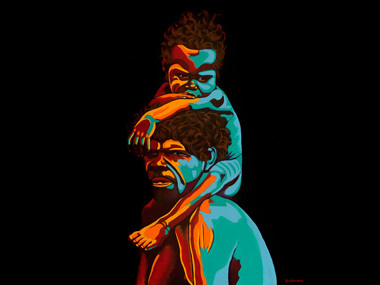 Jandamarra Cadd, a portrait artist from Yorta Yorta in Victoria and finalist in the Archibald Prize 2014 and the Indigenous Artist of the Year – The Deadly Awards in 2011 and 2013, will give a talk following, from 12.00pm-1.00pm. promise to present a valuable insight into the traditional and contemporary arts practices, and the important stories they convey. All exhibitions and both artists talks are free and open to the public. Tandanya Urban Arts Studio is a joint initiative between Tandanya, Anangu artists, Ananguku Arts and the South Australian and Federal Government, in response to a request for a city-based art centre. 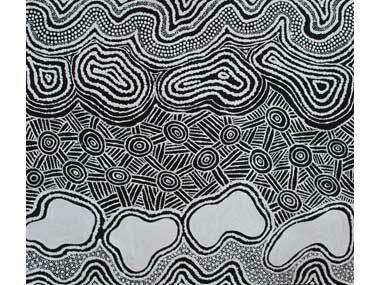 For several years Tandanya and Ananguku Arts have been advocating for an urban studio in Adelaide to enable artists to have a space to call their own when they are staying for extended periods away from their remote desert home in the APY (Anangu Pitjantjatjara Yankunytjatjara) Lands (often for health reasons). The Tandanya Urban Arts Studio provides a safe place to stay, where artists can connect. This Pilot Project has culminated in an exhibition of over 12 works named, Nganampa Tjukurpa – Our Stories. All artworks are available for sale. Tukila Piltari by Tjinkurma Wells.